The GSMR30 Radio combines affordability with ease of use. Waterproof to IPX5 standards, this sleek radio is Bluetooth compatible with easy pairing. With 18 Preset AM/FM Stations, 1 video output and 1 subwoofer output, the GSMR30 is a great unit for anyone seeking a user-friendly way to enjoy music on the water. 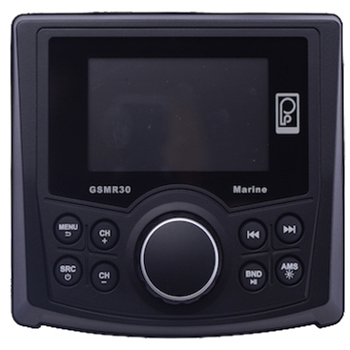 Poly-Planar’s GSMR30 Bluetooth/MP3/USB Gauge Series Radio is an affordable and easy to use marine radio with 4 Channels of 45 Watt power power each. Enjoy listening to your favorite playlist as it streams via Bluetooth from your phone or play one of the 18 preset AM/FM stations. With the GSMR30’s IPX5 waterproof rating, you can eliminate any worries if water splashes onto your radio. Poly-Planar Audio Equipment is backed with a Two-Year Warranty, which is what you would expect from a leader in the marine industry that has been in business for over 48 years. The sleek black display mounts easily into your console with the included mounting template and hardware. It is called a gauge series radio because the cut out to mount it is the same as most engine gauges, 3.1875". The included Trim Bezel ensures a professional looking installation. The radio includes on video output, 1 subwoofer output and 1 pre-amp output. Enjoy yourself on the water without breaking the bank with the Poly-Planar GSMR30 radio. 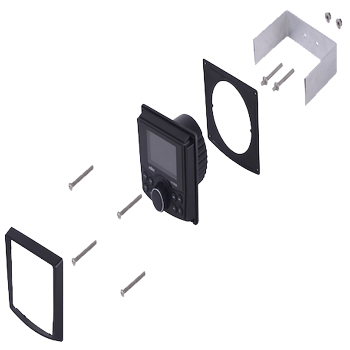 Each Poly-Planar Bluetooth/MP3/USB Gauge Radio comes with:Trim Bezel, Power/Speaker Harness, USB Extension Cable, U Mounting Bracket, Mounting Plate, Mounting Screws, Mounting Nuts, Owner’s Manual. Size: 3.1875" Cutout Diameter with at least 3.75-depth. Poly-Planar MA7050 5” Round Speakers are built to withstand the Marine environment. A complete waterproof design these premium speakers offer 160 Watt peak performance per pair. Includes both white and gray grills. The Poly-Planar MA9020 Speakers can be mounted out of the way under the gunwale, where they’re protected from the elements, yet close enough to deliver rich, full sound.